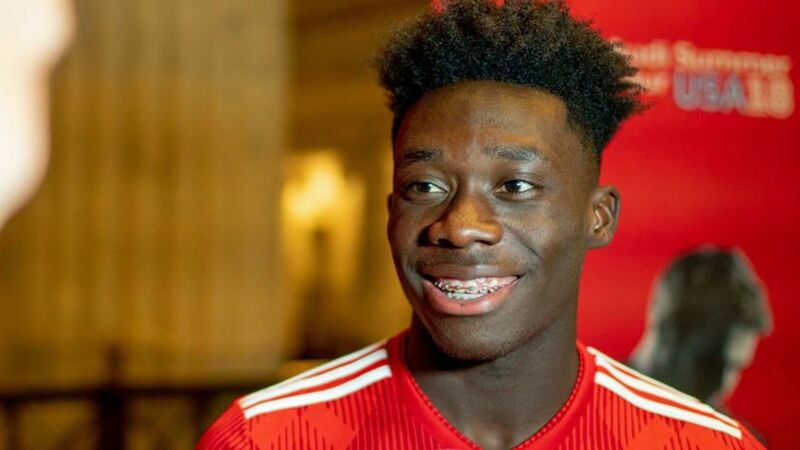 Bundesliga | Where will Alphonso Davies play for Bayern Munich? Where will Alphonso Davies play for Bayern Munich? Alphonso Davies signed off his MLS career with a standing ovation on Sunday after netting both goals for the Vancouver Whitecaps in their 2-1 win over the Portland Timbers ahead of an eagerly-anticipated switch to Bayern Munich. It is a scene that, if his performances in the MLS this season are an accurate indication, he can look forward to experiencing in front of an even greater audience at the Allianz Arena in the spring. In the 67th minute – matching his shirt number – the BC Place Stadium crowd rose in unison to pay tribute to the biggest star they have ever seen rise through their franchise. They are not Davies’ only fans. Bayern coach Niko Kovac is so enthusiastic about the Canadian’s arrival that he has invited him to Munich as early as November – after the international break – even if he will not officially be eligible to play until January. That gives the Croatian coach two months to take a close look at him in training, and determine where he will fit in his side as they turn into the final straight of the season. With eight goals and 11 assists – at the age of just 17 – ‘Phonzie’ can expect to be given some role, yet it is not entirely clear what that will be. With the likes of Franck Ribery, Arjen Robben, Kingsley Coman and Serge Gnabry all established on the Bayern roster, Davies faces arguably the stiffest competition for a place he could possibly have found in Europe, but his inherent versatility stands him in good stead to make an impression. In fact, while the Ghana-born winger spent much of the last MLS season on the left wing, his first year in Vancouver was predominantly spent out on the right. For Canada, his eight caps have been divided equally on either flank. Naturally left-footed, his right is for far more than just standing on. In fact, ambidexterity is one of Davies’ most lethal weapons, with his whirlwind dribbling skills and Robben-esque ability to cut in on his favoured foot and arrow efforts into the far corner. If Bayern were looking for a young man to supply such goals once their veteran Dutchman hangs up his boots, they may well have found him. It would be reductive to claim that is all ‘Phonzie’ is good at, though. Fearless in possession, he has a maturity which belies his age. If the MLS and international football with Canada did not daunt him – and neither did – don’t expect the Bundesliga to become a burden either. To borrow a commonly used idiom, if Davies does hit the ground running in Bavaria, he is going to take some keeping up with. "You can see he has speed, he has skills,” former Bayern and Germany midfielder Bastian Schweinsteiger told Sportsnet. “Offensively, transition wise. He’s very good … He has potential with that speed, with that technique, with those skills. If he works hard, also for the defence, of course he can go on to play in Europe,” added Schweinsteiger, who knows full well the demands of the European game – in particular the upper echelons of it, where Bayern dwell. Davies has grasped that and uses that pace to get back and lend a hand defensively, showing even greater versatility and, above all, positional and tactical awareness by slotting seamlessly into the midfield line in a 4-3-3 formation, and not shirking any of the tackling responsibilities that entails.